NOTE: Updated post with additional photos. The pelican moved slowly, stretching out its great wings in one fluid motion. It lifted its long bill to the sky and opened it briefly, then quickly snapped it shut. Our boat continued to move parallel to the pelican’s resting place, our movement causing me to crane my neck to keep sight of the individual. As the pelican drifted away from my binocular’s view, I turned my attention to another individual and scanned its legs for bands. The only sounds that could be heard were the hum of our boat’s engine and the long calls of gulls from the breakwater’s rocks. “140 total,” called a voice behind a pair of binoculars. The voice belonged to John Luther, who was in charge of keeping the total count of pelicans per section for our count. “14 brown heads,” followed Emilie Strauss, who was counting the total number of younger birds per section. The younger birds have brown heads – as opposed to the adult birds’ light golden heads – making them discernible in the group. It was a breezy September evening. The vessel Sparky, captained by Jim Labbe, slowly moved parallel to the Alameda Wildlife Reserve Breakwater Island, allowing us a clear view of the roosting pelicans without disturbing them. Leora Feeney, along with Deborah Jaques, assessed the pelicans coming and going to the breakwater from shore. Leora, our team’s organizer, was instrumental in orchestrating our efforts for the task at hand: counting the thousands of pelicans currently roosting at Alameda Wildlife Reserve Breakwater Island. Luckily, our team’s local knowledge of the area is vast. 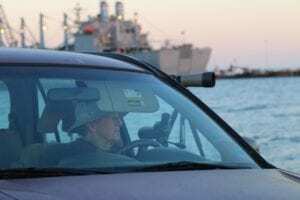 Since 2004, Leora and John have coordinated their own efforts to monitor the breakwater’s pelicans twice a month as part of the All Bird Surveys done at Alameda Wildlife Reserve. 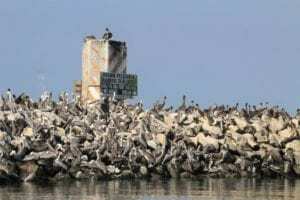 Alameda Point’s Breakwater Island, a half mile long wall of boulders built to protect the area from wave action, is a Brown Pelican roosting area. Our site is just one piece of the West Coast Brown Pelican Survey, a collaboration between the U.S. Fish and Wildlife Service, Audubon California, and Audubon chapters along the coast of California, Oregon, and Washington. 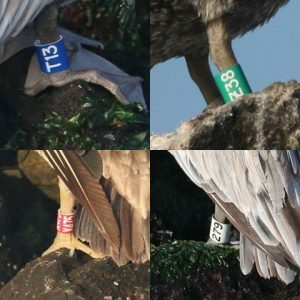 The survey occurs twice a year – once during the breeding season and once during the non-breeding season – and monitors both the total observed counts of Brown Pelicans and the ratios of younger birds within those numbers. I watched, spellbound, as a pelican on the breakwater’s rocks delicately maneuvered its massive bill along its wing feathers, moving it open and closed to resemble a nibble as it preened. After an hour spent out on the water, a brown pelican’s water-soaked feathers compromise its ability to thermoregulate; thus, all pelicans need roosting places to dry, preen, and rest. 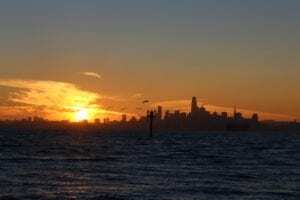 For this reason, knowing the locations and pelican densities at roosting sites such as the Alameda breakwater is critical to brown pelican conservation. The pelicans themselves are living, breathing ambassadors for an incredible conservation story. Brown Pelican populations in the 1960’s and 1970’s were driven to drastically low numbers by pesticides, especially the infamous dichloro diphenyl trichloroethane (DDT). DDT made its way to ocean ecosystems, extending its deadly reach to include pelicans. Multiple bird species, including Brown Pelicans, began to have very thin eggshells: a sinister mark of DDT. The delicate, compromised eggs were crushed under the weight of the adults trying to incubate them. The drastic effects of eggshell thinning caused the population at the Southern California Bight, a section of the California coastline including the Channel Islands, to drop to less than 1,000 pairs in the 1960’s and 1970’s. In 1969, just 5 chicks hatched from 1,272 nesting attempts in a Southern California breeding colony. By 1970, the Brown Pelican was listed as endangered by a law preceding the Endangered Species Act. Subsequently, most uses of DDT were banned in 1972. Brown Pelicans remained on the endangered species list until 2009, when the last subspecies, the California Brown Pelican, was delisted. Groups of pelicans flew above us with their wings flapping in graceful unison as Sparky continued its slow progression across the water. The sun shone on our faces, hushing any slight chill that September might have brought. This part of the year is a special time to see Brown Pelicans in Northern California. Starting around December, birds fly to coastal areas to breed. In California, their breeding range extends southward from the Channel Islands. Each year after breeding, the pelicans disperse north, where they can be seen along most of California’s coast and up into Oregon and Washington. We continued counting the pelicans, along all 11 sections of the North and South sides of the breakwater. Save for a too-close speedboat that flushed numerous birds, and a surprising observation of four resident bottlenose dolphins, we maintained our focus and concentration. There was a collective buzz of excitement in the air, yet I couldn’t help but feel a twinge of concern nagging in the back of my mind. The reality of today is that threats to our Brown Pelicans still loom: in California, dozens of starving pelicans began showing up in unexpected areas in 2018. From 2010 – 2012, unprecedented Brown Pelican disturbance to a common murre colony in Oregon was recorded as hungry juvenile pelicans took the eggs, live chicks and leftover food from common murre colonies. Such scenes raise concern for the health of the Pacific sardine and anchovy populations – two important forage species for California Brown Pelicans and other fish-eating animals. The world of these birds is still awash in a sea of uncertainty. The sun set, casting a yellow haze on San Francisco’s skyline. The horizon began to take on a purple hue. Groups of pelicans flew in towards the breakwater in formations as large as 400 individuals. As they flew low, their bodies hugged the surface of the water, causing their flapping to blend in with the steady movement on the Bay’s surface. While the team on Sparky counted birds coming from the west, the team on shore kept track of birds coming and going from other directions. Excitedly, our group huddled on Sparky’s stern to count. Jennifer and Judy called out large incoming groups as John and Emilie worked swiftly to count them. I stood in the middle of it all, recording and repeating the numbers being called out. We continued in our work, absorbed for over an hour, until darkness swept over the bay. Even as the light faded behind San Francisco’s skyline, we stood, squinting, discerning pelican silhouettes against the city lights. Somewhere in the area ahead of us, a Caspian Tern called its familiar, raspy call. Despite the darkness, the night was alive. Then, it was 8:28 PM – one hour after sunset. Like the flick of a switch, the count was over. We slowly made our way back to the marina, surrounded by the illumination of classy boats lined with string lights and restaurants on the docks washed in a warm light. Once we reached the marina, we made our way to meet Leora and Deborah at the yacht club. After many stories exchanged and laughs shared, I sat at the yacht club’s nearly empty bar counter with pen in hand. Jennifer joined me, and together we worked to tally up the results. Our initial count of the pelicans present on the breakwater was 2,485. Following that initial count, our team counted the number of pelicans flying to and away from the breakwater. The net number of pelicans flying to the breakwater after the initial roosting bird count was 5,601 – proving that this breakwater is an important nocturnal roost destination for the pelicans. 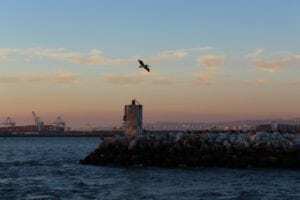 Even 30 minutes after the sun had set, over 1,000 birds were observed flying to the Alameda breakwater. Our final count on and by the breakwater was 8,086 brown pelicans. This count is the site’s highest in years, second only to a July 2006 count of 8,500+ pelicans at the breakwater in the early evening. Long-term monitoring is critical to keep track of Brown Pelican populations since their removal from the endangered species list in 2009. 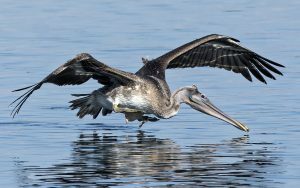 Since its beginning in 2016, The West Coast Brown Pelican Survey holds promise for assessing pelican population usage and health across a large area. The data collected documents Brown Pelican population status in the face our changing climate and fluctuations in prey availability. 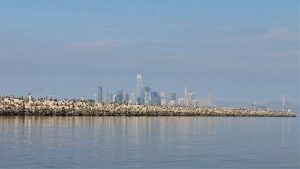 Twice-monthly local monitoring, like the those conducted at Alameda Point’s Breakwater Island by Leora and John Luther, is incredibly important. Understanding both the big picture of bird populations, as well as persistent surveying of a particular locality, are key baselines that inform advocacy for birds. Roost sites – particularly nocturnal roost sites – are critical areas for Brown Pelicans. 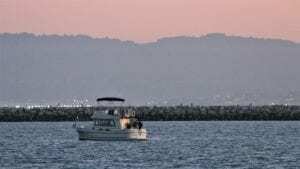 The record Brown Pelican numbers at Alameda’s breakwater make it obvious that protecting the area and its inhabitants from disturbance is a conservation priority. This becomes increasingly important as the surrounding area continues to develop, including plans to build a Seaplane Lagoon Ferry Terminal, whose vessels would bisect a narrow gap in the breakwater adjacent to the pelican roosting area. My Prius hummed in quiet protest as I accelerated onto the 880 South ramp, headed from the marina back towards my home in the South Bay. My mind gently rocked, convinced I was still on the water. What part will I play in this story as it unfolds? I pondered, driving along the highway in a sea of taillights. As I drove, the team’s passion for the area’s wildlife and natural areas lingered in my mind: Leora’s grassroots advocacy for the area surrounding the Alameda breakwater, which manifested itself as the Alameda Wildlife Reserve to protect our local endangered California Least Terns; John’s vast knowledge of the birds we observed, and his passion as he spoke of his field trips with his College of Alameda courses to the area to witness its wildlife; Emilie’s face brightening as she spoke of her roots as a field biologist at Mono Lake, and her count of thousands of Vaux’s swifts just the night before; Judy’s excitement as she spoke of various island adventures where she visited breeding brown pelicans during the filming of her movie, Pelican Dreams; Jennifer’s thoughtfulness as she spoke about the least terns she monitored, and the happenings in their colony; Deborah’s dedication to studying the pelicans for decades and her fierce devotion to roost site conservation (she had already made plans to kayak to the breakwater early the next morning to re-sight more bands and photograph individuals); And Jim, our captain, who set aside a whole evening to safely shuttle a team of volunteer pelican counters for citizen science. Yes, I concluded, the path for our community’s involvement in the protection of our natural areas has been blazed and is a road well-travelled. As a part of this community, it is important that I and others continue to collect hard data and use what we learn to inform our advocacy efforts. I thought of the pelicans, their large bodies in formation against the backdrop of San Francisco’s skyline. And I pondered that juxtaposition embodying our challenge: how to preserve such incredible birdlife even as humans persistently alter the environment. Thank you to Leora Feeney, Deborah Jacques, and Jim Labbe for reviewing the piece and providing additional information. Thank you to the pelican count team for reviewing the piece as well, and for their outstanding work and dedication. Taylor Crisologo lives in the South Bay, where she avidly birds and runs a site on Bay Area nature (www.bayareanaturalist.com). She studied biology at Cornell University, where she worked with the Cornell Lab of Ornithology on projects ranging from breeding herring gulls off the coast of Maine to dancing lyrebirds in Australia’s Blue Mountains.